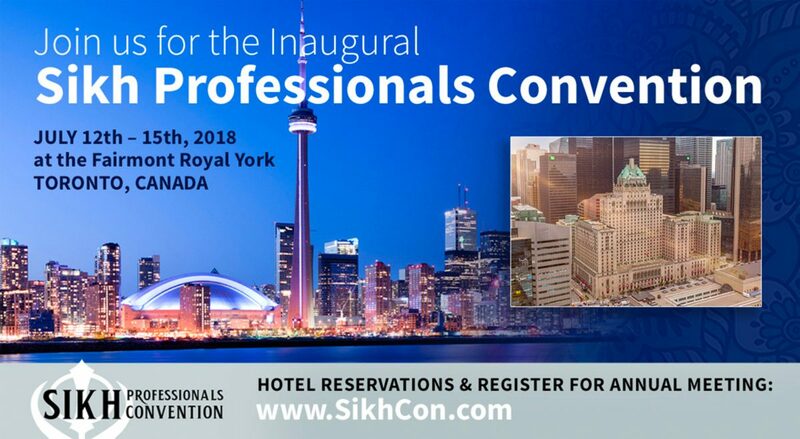 The 2018 Sikh Professionals Convention will be held from July 12-15, at the Fairmont Royal York in Toronto, Canada! Registration is now open, click here to REGISTER for the meeting! The Sikh community has been an integral part of the fabric of the North American landscape for more than 100 years, when the first Sikhs came to Canada in the early 1900s. Notwithstanding numerous challenges, we as a community have made tremendous progress by engaging in all facets of society. However, despite the fact that a significant proportion of the community works in various professional careers, as a community, we have no large professional organizations. Although multiple attempts have been made to create such organizations, they have often dissolved or contracted to local organizations. One exception to this has been the North American Sikh Medical and Dental Association. In 2017 NASMDA celebrated its 25th anniversary as one of the largest and longest standing Sikh professional organizations. Many members of this organization, as well as other leaders in the Sikh community have often discussed creating a much larger Sikh Professional organization that would allow other Sikh professionals to network and connect with each other, and expand what NASMDA has been able to achieve for those in the medical field. The hope is that by creating a larger network of Sikh professionals of all fields, we can exponentially increase the ability of Sikh professionals to network and connect with one another. This would allow us to provide even more support to various Sikh philanthropic initiatives, as well as future Sikh professionals in all fields by providing scholarships, training opportunities, as well as financial support. In doing so we hope to help foster even more future leaders in the Sikh community. In hoping to accomplish this goal, we are hosting the inaugural Sikh Professionals Convention this summer in Toronto, Canada on July 12-15, 2018. This will be held in conjunction with the NASMDA annual meeting, but with the goal of also creating various Sikh professional organizations in other fields. We would therefore like to invite Sikh professionals of all fields, including lawyers, engineers, financiers, entrepreneurs, and numerous other professions to attend this meeting, and participate in this vital community infrastructure building. I would therefore humbly like to extend an invitation to all Sikh professionals interested in being early pioneers, or help lead this initiative, to attend this inaugural Sikh Professionals Convention. My hope is that by creating this opportunity for all of us to meet and connect with one another, we can together help create a vital institution for the future of our Sikh community in North America.